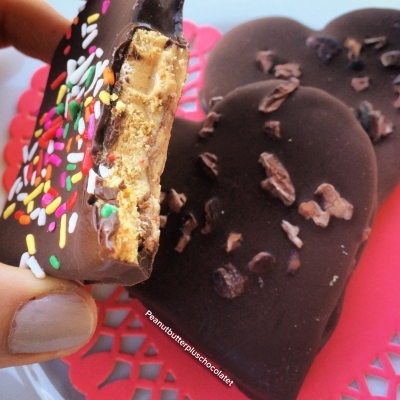 Delicious chocolate covered peanut butter hearts with S'mores Quest Bar. Warm up quest bar in the microwave for 10 seconds and roll it out with a rolling pin. Use a cookie cutter to make heart shapes. Mix peanut butter, coconut flour and protein powder in a bowl, once combined roll the dough into a ball, roll it out with a rolling pin and cut out 3 heart shapes. Place the peanut butter hearts over the quest heart In a microwave safe bowl or double boiler, melt chocolate chips and coconut oil. Pour chocolate over hearts until completely covered and let harder in the fridge or freezer.